It would be an understatement to say that I am a Nancy Drew fan. Nancy does so many things well. She can scuba dive and ski, she’s a top-notch golfer, she plays tennis and table tennis with aplomb. No one can compete with Nancy when it comes to spotting false bottoms in old trunks, cracking codes, analyzing handwriting, and following hunches. Frank and Joe Hardy, eat your hearts out. 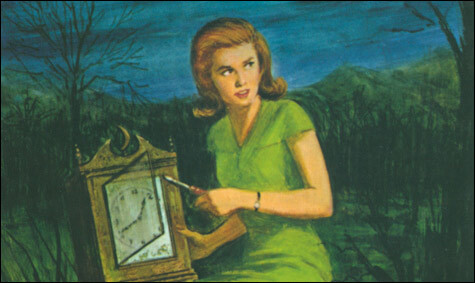 I love Nancy Drew, and despite all of my college-graduate-level cynicism and worldliness I still read her books all the time. But — there are some issues with the way crime and punishment gets approached in Carolyn Keene’s Nancy Drew mysteries. I know, you’re shocked, but hear me out. For one thing, Nancy can almost always identify a bad guy (usually guys, but not always) upon first meeting him/her. Thank goodness judges and jurors never put any stock in superficial, snap judgments of defendants. Har har har. “Well, okay. Follow me,” the police officer directed. Then again, that’s probably a pretty realistic portrayal. Nancy and I are, after all, part of the demographic least likely to be perceived as a threat, least likely to be a victim of property crime or violent crime (except as a victim of domestic violence), and least likely to be arrested, charged, or incarcerated. So either Nancy told it like it is, or we based our criminal justice system on Nancy Drew books, or – like pretty much all examples of crime in the media – it’s a combination of both. Most significantly, all of Nancy’s stories end with justice being served. The little old lady, young, innocent child, or hardworking business owner get the money and security they deserve; the evil ex-con or devious femme fatale is behind bars for “a long time,” and everyone can go back to chiding Bess about her weight in peace – at least until the next mystery comes along. This is a recurring theme in media portrayals of crime and criminal justice. Too bad it’s not a recurring theme in the actual criminal justice system. But more on that later.